Fifteen years ago, on the day I found out I was pregnant with Sadie, we went directly from Planned Parenthood to the arcade at the mall in Santa Fe. There was a walk around the block in the middle somewhere, a walk I’ve written about a lot in past years, around the little streets behind the clinic, with Joey and I talking about whether or not this was the moment, the child. We decided it was, and that she was, and we got into my silver Saturn and drove down Cerrillos in with the August heat shimmer all around us. We cashed in all the money we had in our pockets for quarters, and for the next hour we didn’t speak but only shot guns at aliens, and steered race cars into walls, crashing and burning like I tend to do in those games. When we were out of quarters, we left, got back into the Saturn and called our parents to share the news. It August Santa Fe rained then, so hard that the parking lot flooded and we had to press our ears to the phone to read the tones in our parents’ responses. Over the next days and months we would talk about how we would do this, how we would make a more stable environment than either of us had had, how we would parent, and relate to each other, and all the things we would need to learn. But more than any of those conversations, I remember the strange daze of the arcade, and shooting the gun, and feeling a new deep hollow fear I would later come to know as risk and attachment and the terrifying possibility of loss. A few weeks ago, we dropped Sadie off at high school. She’s known for years that she wanted to go away to school, and she made it happen just in her way, and she’s not very far away. But we walked away from her, now 3 in the car instead of 4, and Rosie said we should go to a museum nearby, and that’s what we did. We wandered around the museum, half looking at the art, moving quickly, and it felt exactly like that arcade. It was like an airlock before the new life started, entirely different but also so familiar. This past weekend, I worked my last farmers’ market. It’s been 10 years of markets for me, but my work schedule’s changing and it’s time to change with it. It’s those mornings at the market that started me writing and making recipes in the first place, and most of the recipes I’ve written have come out of conversations there. I’ve found myself quieter and a little less inspired this summer, but just at the end of this last market, a customer shared a recipe with me, and that seemed like a very fitting way to end this big and radish-filled chapter. Over the last few years I’ve developed an allergy to potatoes. I think it’s mostly the skin, but my reaction is so unpleasant that I pretty much avoid all potatoes at this point. But the thing I miss most is potato salad. Especially right now when the potatoes are new and creamy, I’d be making it all the time. I have a mustardy, vinaigrette-based one in The Homemade Kitchen, and that one is my standard. Right in those last few minutes before 1:00, a woman came up in line with several bunches of turnips. These aren’t storable big thick turnips, but what we call (among other things) salad turnips, because they’re good raw in a salad. There are two varieties that we sell- scarlet, which is crunchy and hearty with red skin, and Hakurei, which are white and silky and sweet. I’ve often said that’s it the turnip that got me started in food, due to mysterious warm buzz I felt in sharing the news that they could be caramelized in the oven or chopped into soup (you never know how your career will hit you, but I’ve learned to keep my ears perked for that buzz). I asked this particular customer what her plans were with all those turnips, and she said she used them instead of potatoes in her potato salad. THIS IS A RECIPE FOR ME! I thought, and I pulled a few bunches off the table then and there. So this is a not-much-of-a-recipe but rather a sharing of what seemed like a revelation to me. I cut the turnips into large bites (no need to peel first), tossed them in salt and olive oil, and roasted them on parchment in the oven at 425°F until they went a bit golden, which took about 25 minutes. I made a vinaigrette in the bottom of a large bowl with some mustard, some pickle brine, and some olive oil. 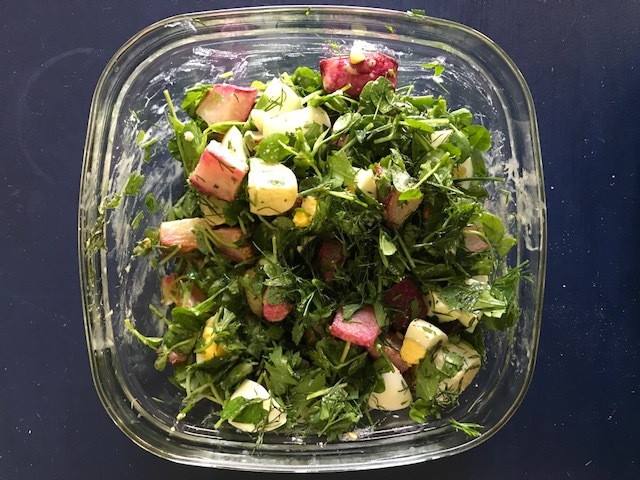 I added the warm turnips (both red and white) to that dressing, along with a whole mess of chopped parsley and dill, 2 chopped hard boiled eggs, some chopped pea shoots, a few chopped up radishes. Salt, pepper, taste, repeat. And then I had potato salad, only it was turnip salad. I think this method would be equally good if you’re a mayo-based potato salad person as well. We’re in what seems to be the last day of a very strange heat wave around here, and it’s been a stretch of 95 degree days as we come up to October. I’ve never been a fan of inappropriate weather- I like July to be hot and September to require a sweater. Of course inappropriate weather is all the rage these days, and if sweaty is all we get, we’re a lot better off than many. And I can’t always be in charge, and in matters of time, and change, and most things as it turns out, I’m still working on my skills of taking what comes, and possibly with grace, and maybe even I get bonus points for having a few good dishes ready to eat in the fridge. Tonight we’ll swim, and eat cold things, and then maybe October will be more familiar. I love that your daughter knew she wanted to go away to high school and “made it happen”. Congratulations to you and Joey on raising such an inspirational and independent young woman. When Sadie,(and Rosie), take over the world it will be a better place to live. I can’t wait. Lovely, lovely Alana! I’m trying to imagine the changed atmosphere in your house. I know it’s dramatic, but I know that Sadie is so ready for this new adventure! And the turnip salad sounds wonderful! Thank you, Amanda! And I HAVE TO TELL YOU- my allergy is the same! It seemed like too much detail to get into in the post, but I have determined that I’m just allergic to the skin! That being said, the reaction is so bad, I’m pretty much steering away from potatoes all together. But you are the first person I’ve spoken to who has the same allergy! This made me tear up Alana. Bravo to Sadie for going and bravo to you and Joey for letting her go. One of my brothers went to boarding school for high school – it was the best thing for him, he enjoyed it so much and had such an amazing experience, but we sure did miss him! Thank you Thank you! I have about 15 harukei turnips waiting to be eaten… Now I know what to do with them! …made me laugh out loud, a much needed break from my Friday.